10th June 2018 – Three days after setting a new British 100m record in Oslo, Dina Asher-Smith was back in action at the IAAF Diamond League in Stockholm. Having won the 200m here last year it was the 100m on this occasion but with the same outcome. When setting her British record in Oslo Dina actually finished second behind World Indoor Champion Murielle Ahoure but she was able to reverse that result here and cross the line in 10.93 seconds, just 1/100th slower than Oslo despite running into a slight headwind. 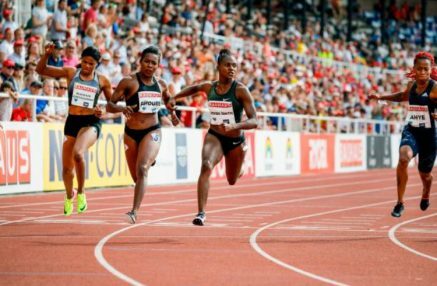 Shamier Little (USA) has also competed in Oslo and she switched to the flat 400m for Stockholm and ran her second fastest time ever of 50.82 seconds to take fourth place. There was a PB for Andrew Osagie over 1000m as he set new figures of 2:17.18 for seventh place. There were seven PACE athletes in action at the Racers GP in Kingston, Jamaica, three of them in the men’s 400m. Fred Kerley (USA) narrowly missed taking the win as he clocked 44.36 seconds for second place (1/100th behind the winner Kirani James), Bralon Taplin (GRN) was third in 45.11 seconds and Matthew Hudson-Smith (GBR) was fourth in 45.40 seconds. Jenna Prandini (USA) took second place in the women’s 100m in 11.14 seconds with Schillonie Calvert-Powell (JAM) seventh in 11.51. Laura Roesler (USA) was fifth in the women’s 800m timing 2:02.29 and Ristananna Tracey (JAM) was seventh in the women’s 400m hurdles. In other European meets, Steph Twell (GBR) achieved a European Championhips qualifying time as she ran 15:18.77 for 5000m and fifth place at the Next Generation Athletics meeting in Nijmegen and Michael Rimmer (GBR) ran a seasons best of 1:47.45 over 800m in Huelva.